Knowledge Base is a complex tool that allows building both an internal database for your agents and an external public help center for customers. With our Knowledge Base you get: 1. The internal widget - it lets you quickly access help articles in the sidebar in LiveChat. From now on your support agents can have all the knowledge at their fingerprints any time they need it. What's more, thanks to internal search, images support, quick 'add to reply' buttons and artificially intelligent articles' auto-suggestions, you can speed up the chat resolution time and save time on switching the tabs. 2. The public Help Center - it gives your customers self-service materials so that they can help themselves when you're not around. What's more, the Help Center is aligned with your brand's voice & style (thanks to the customizable logo, URL, and headline). As a result, it opens a new support channel for your clients. It's also visible for the search engines and can bring new traffic to your website. The Smart Knowledge Base Plan costs $39 / month per license, while the free plan is free of charge for LiveChat users. The full feature list per each plan can be found at https://www.knowledgebase.ai/. 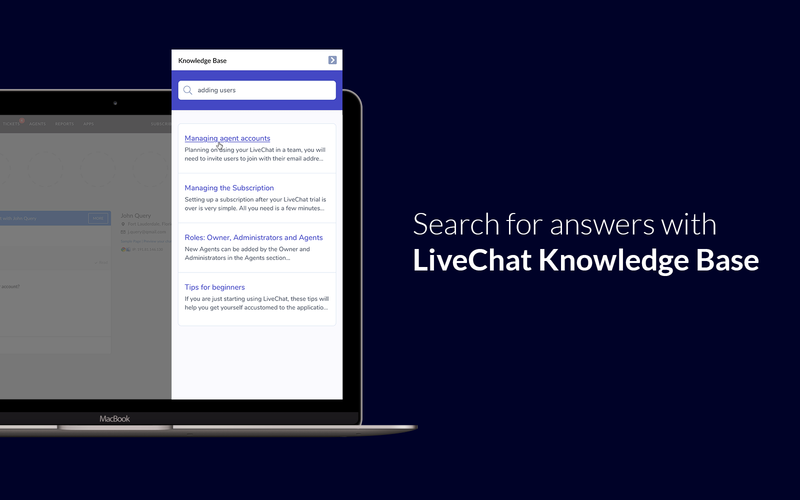 Connect with LiveChat to provide agents with helpful resources when they are chatting with customers. Create content effortlessly with a rich text editor that supports images, GIFs, and videos. Quick Replies are the one-click buttons that insert a fragment of a text or a public link to the article into the chat area or a ticket. Build a public Help Center in minutes and let customers find answers to common questions, on any device. Organize content with topics, visibility setting, and keywords so customers and agents can easily find what they need. Let us suggest you relevant articles based on the customer’s question for faster communication. Fulfill gaps in your content and Improve articles using customer feedback. Google Analytics included. Make your customer service more efficient. Provide tools for your agents to improve their productivity. Let them resolve customer issues quickly and smoothly. By publishing help docs in one central location, you give your customers opportunity to find answers without even contacting your support agents. Our AI will help answer your customers’ questions by suggesting relevant articles to insert into the chat. Click and done. 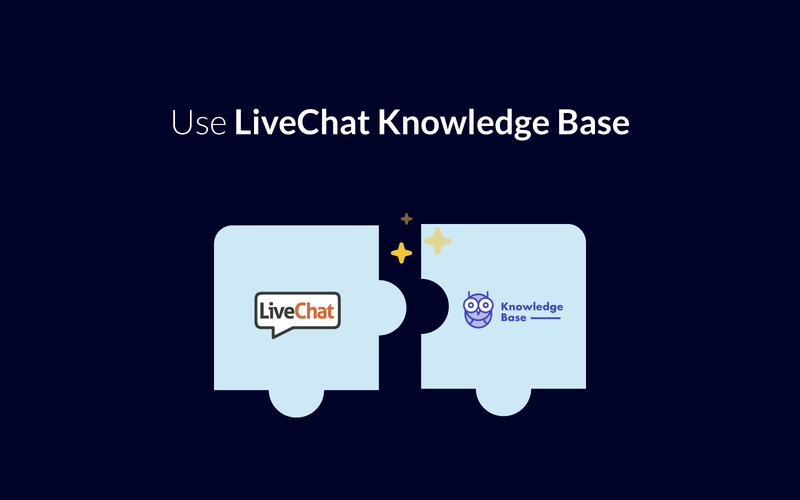 Start using LiveChat with KnowledgeBase now!